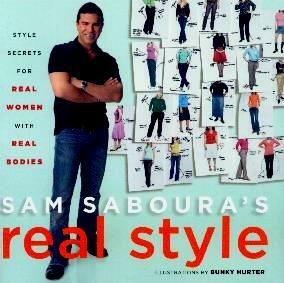 Sam's style is worth investigating because he has a practical and workable approach. He undersands and gets (finally!) that women come in all shapes and sizes and that not all "fashion" is for everyone. In his intro he says, "I learned how to fool the eye with the right clothes, how to balance the most difficult proportions, and how to create a head-turning look on any budget". In my opinion, the basics of style, which sadly, most women aren't even aware of. And he says, "It's about creating your own successful look instead of following someone else's trend". Yes! This is what I've been saying for years. Sam starts out by identifying the various body shapes and how we can accenuate where we're lacking rather than adding to where we shouldn't, and then goes over dresses, pants, skirts, T-shirts, undergarments, and more. He gives us advice on which length of pants to wear and where the hem should be on longer pants; the most flattering length for jackets; who should and shouldn't wear florals, and little "real style secrets" dotted about the book. He also covers denim jeans, suits, and the ever-popular accessories. My thoughts on accessories (especially jewelry) is that they are so often over-the-top. I can't stand the "matched up" look (matching earrings, necklace, bracelet, and ring - yuck!). You'll learn a few Hollywood secrets about undergarments and bras in particular. I loved Binky Hurter's illustrations as her "models" are always smiling, no matter their shape or size - the way it should be. Someone who's style (or stylist, as the case may be) I admire, is Sharon Osbourne. She wears "balanced" clothes and always looks elegant and smart. I'd give my eye teeth for a couple of her pants suits. Visit Sam's website at www.samsaboura.com. Conclusion - Exceptionally constructive and worth reading and absorbing if you want to make the most of your shape.